Jamaican Mommies in collaboration with its sisterhood of Jamaican Moms at home and in the diaspora are on a mission to be our sister’s keeper by providing needy moms with clothing, toys and other back to school items. The drive is a collaborative action between Jamaican Moms in the diaspora and the local Jamaican Mommies Network. According to Jamaican Mommies Founder, Shanoy Coombs, the Jamaican Mommies network is grateful for the collaborative action to positively support mothers in need. “There is so much good in this world and we are truly grateful for the members of the Jamaican Mommies diaspora who have reached out and will be putting together new and gently used items to help some of the neediest moms just ahead of the new school year” she said. To ensure items are available in a timely fashion, members of the public are encouraged to start sorting their new and gently used items and arrange for these to be collected by Friday, August 10, 2018 by the Jamaican Mommies team. The list of diaspora contacts will be announced in short order. Later on in August, items will be laundered and needy moms can visit the Jamaican Mommies “boutique” and select items for their family. 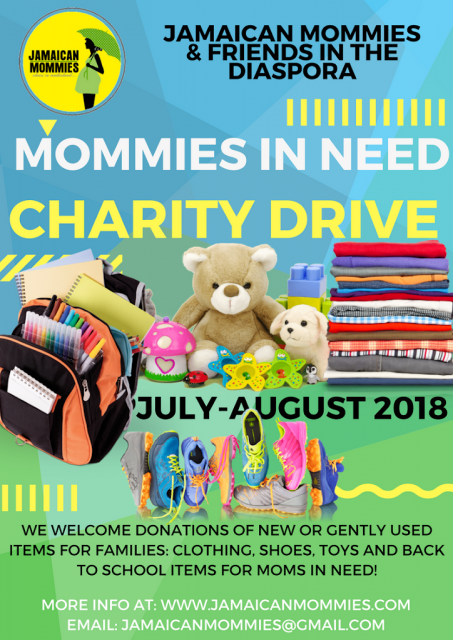 The Mommies in Need charitable drive is one of many initiatives being rolled out by Jamaican Mommies as it prepares to celebrate 10 years of existence in 2019. For queries related to this charity drive, persons can contact Jamaican Mommies at jamaicanmommies@gmail.com or 8764276021. Want to be a volunteer with the Jamaican Mommies network? sign up today!! !